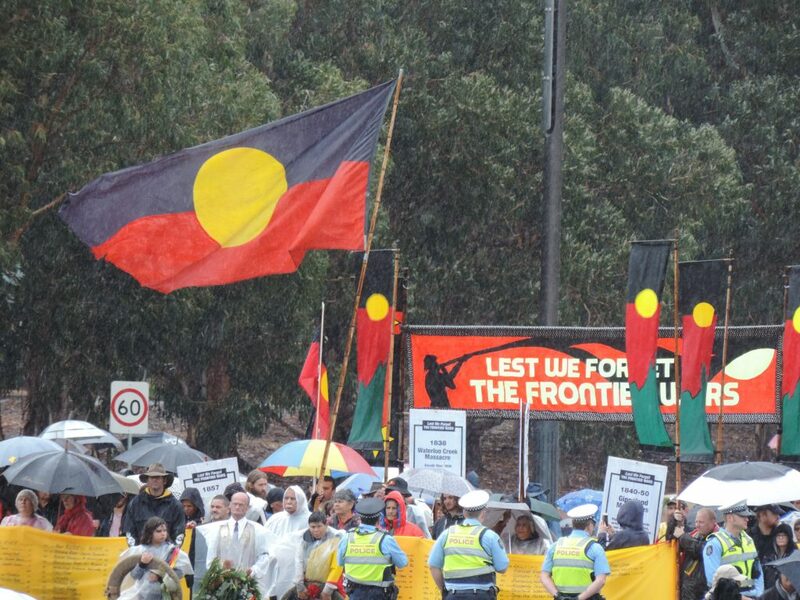 The Australian Frontier Wars March is held in Australia’s national capital, Canberra, every Anzac Day on 25 April. Marchers assemble at the foot of Anzac Parade leading to the Australian War Memorial (AWM). 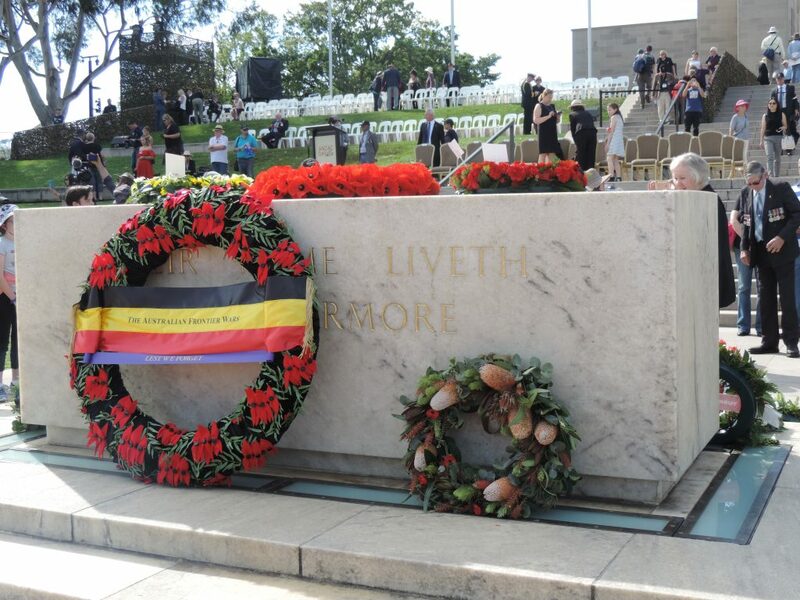 Participants commemorate those Aboriginal and Torres Strait Islander people who gave their lives defending their homelands from the incursions of British and other colonists from 1788, when the First Fleet arrived in what we now call Sydney. 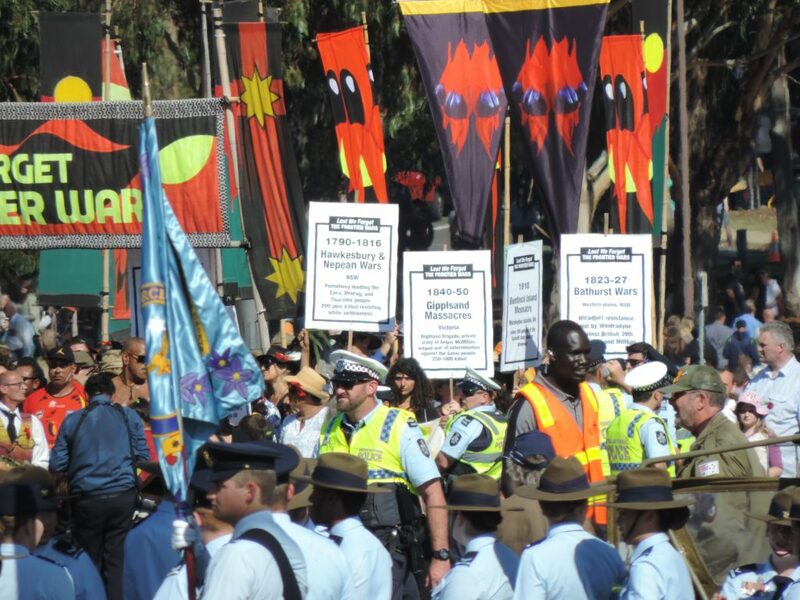 Although not permitted to join Anzac Day veterans commemorating the fallen of overseas wars in which Australians have participated, Frontier Wars marchers hope that one day the AWM and Australians generally will accept colonial frontier conflicts as befitting official recognition as part of Australia’s war history. In 2017, for the first time, Aboriginal and Torres Strait Islander veterans were permitted to march together at the National Anzac Day Ceremony in Australia’s capital, Canberra. Eleanor Gilbert’s video of the Diggers March 2017 can be viewed by clicking on the arrow in image below. The theme of the Australian War Memorial’s For Country, for Nation exhibition, now touring, (details at: https://www.awm.gov.au/visit/exhibitions/for-country-for-nation), held in Canberra from 23 September 2016 to 13 September 2017, is ‘Defending country–Indigenous Service’. In the For Country For Nation exhibition in Canberra, the AWM included two paintings of massacres that took place in Western Australia: Queenie McKenzie’s Horso Creek killings and Rover Thomas’s Ruby Plains Massacre 1. The intention of these works, and others like them, are Aboriginal historical records of events that occurred and have been handed down through the oral tradition, but not necessarily recorded in government archives. Queenie McKenzie’s painting depicts an 1880s incident in which colonists shot a group of Gija people for driving away bullocks. To hide the evidence of the murders, the Gija people’s bodies were burnt. The mother of a boy who survived the massacre found him hiding in the carcass of a bullock. Rover Thomas’s painting is one of a series he created to record ‘the killing times’ in the East Kimberleys, Western Australia from the 1880s to the 1920s.